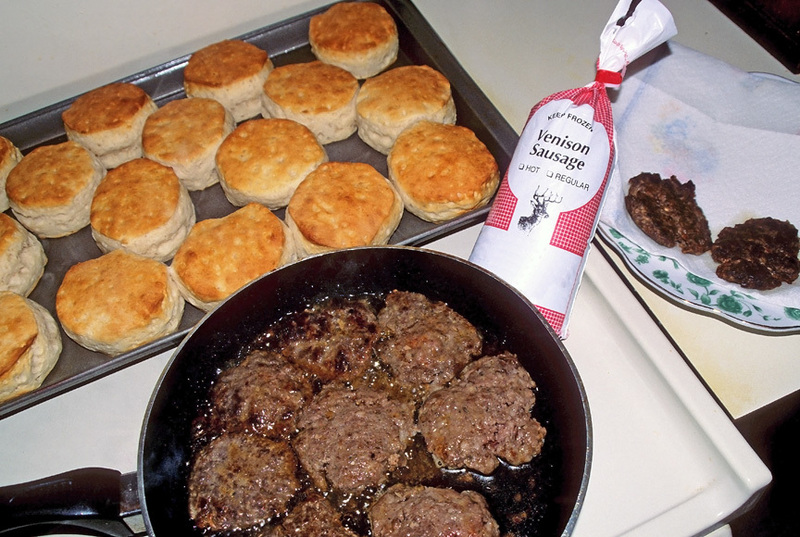 I love sausage biscuits, sausage and eggs, and sausage used as an added ingredient in many of my family’s recipes. Pork sausage tastes great, but I much prefer the rich flavor of deer sausage. When I make a batch at home, I also can create a sausage that’s much leaner and healthier. At one time, I thought sausage-making was too complicated. But after giving it a try, I know now that making a batch of this spicy breakfast food at home is really quite simple. Once all the meat is properly prepared, it takes less than an hour to make a 4-pound batch my family can enjoy for several weeks. After killing a deer, field-dressing and skinning it, I remove the tenderloins and loins and prepare them for cooking or for the freezer. The remainder of the deer, with all the entrails removed, is quartered and taken to a meat processor for preparation. I ask that they cut the hams into steaks, then grind the rest of the meat and package it in 1- or 2-pound packages. If you decide to do likewise, be sure to ask the processor not to add any fat to the ground meat. They often add beef fat, which seems to me to give the sausage an off flavor. I prefer to add my own fat later when making the sausage. Also ask the processor not to freeze the meat. Some do, but you’ll want some fresh-ground venison so you can make fresh sausage as soon as you’re home. You can also purchase a meat grinder and prepare the ground venison yourself. Just be sure to remove all silverskin, fat, gristle and bone before you run 1-inch cubes of the meat through the grinder. Any cut of meat can be used, and sausage-making is a good way to use tougher cuts like neck meat and scraps you might not use otherwise. You can freeze the packaged ground venison and use what you need throughout the year after thawing it. But I always like to set aside 3 pounds to make a 4-pound batch of fresh sausage I can sample as soon as possible. Note: If your local meat counter makes fresh sausage, and if you’ve tried it and found it to your liking, you might ask if they’ll sell you some seasoning mix. (Be sure to ask how much to use per pound of meat.) Otherwise you’ll need to buy the ingredients items above from which you’ll create enough seasoning to make 4 pounds of sausage. Start your sausage making by mixing the seasoning ingredients in a big bowl: fresh sage, fresh thyme, brown sugar, kosher salt, crushed fennel seeds, crushed red pepper flakes, coarsely ground black pepper, garlic powder, and paprika. In another bowl or a pot — one that is large enough to handle 4 pounds of meat — add the 1 pound of ground pork and 3 pounds of ground venison, and sprinkle the seasoning mixture over the top. Work the seasoning mix into the meat with your hands or a large sturdy fork until it’s very well blended. That’s it! Your sausage is ready to cook. To make patties, I scoop out 1/4-cupfuls of the mixture, place each on a piece of waxed paper and flatten until about 1/4 inch thick. Cook on a griddle or in a skillet over medium-high heat until browned on one side, about 2 to 3 minutes. Then, flip and cook 2 to 3 minutes more or until well done. You can make the patties a couple of days ahead of time, stack them between pieces of waxed paper, cover and chill. Or prepare the patties, place them between pieces of waxed paper and freeze in a zip-seal bag until you’re ready to use. I find they freeze well up to a month, but rarely do they last that long in our home. The fun part of sausage making is experimenting with your own seasoning mixtures. I like the one presented here best, but you’ll find many other recipes you can try on internet cooking sites. You also can vary the amount of ground pork you add to create sausage that is juicier or leaner to your preference. If you’ve never tried sausage-making before, give it a try. It’s much quicker and simpler than most folks realize, and you’ll enjoy the reward of a delicious meal created from wild game you killed yourself. Enjoy! Still hungry? Find surprisingly-good Deer Meat Recipes for dinner.